All 10 million Europeans: demographic collapse. The last two generations grew up with the idea of the "population explosion". For a century the world has lived with constant upward revision of population forecasts: the only question was if the growth would be fast, or very fast. And the last generation faced the question: how many billions can this planet support? So it is a culture shock, when new projections of global population include scenarios of dramatic population decline - without any meteorite impacts, new epidemics, or famines. Or when a UN report suggests that Europe needs 700 million immigrants to maintain its age structure... Is the future population nightmare not rural Bangladesh, but rural Estonia? Updated June 2007. The myth of population growth was strong until recently. 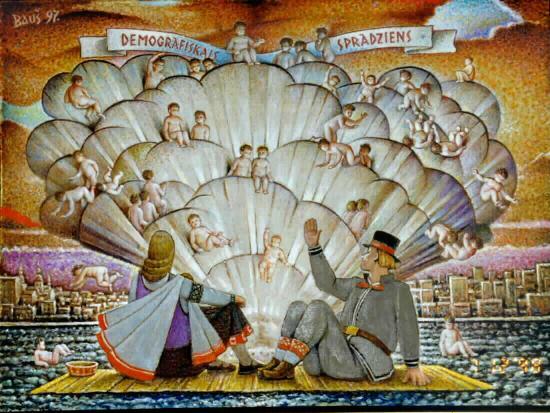 A few years ago, the website of the Latvian centre for demography research included this image of the population boom, a 1997 painting by A. Bauskenieks called Demographic Explosion. But the image is the opposite of the truth: the population of Latvia is falling - month after month, year after year, as the tables at Latvian Statistics show. Population fell from 2 529 000 at the start of 1995, to 2 276 200 in May 2007. Latvia joined the EU in 2004 with the highest death rate, and largest natural population loss, of all member states. Apparently, the Demographic Centre has realised the painting is inappropriate: it has been moved or deleted from the website. Latvia now needs research and policy for a demographic collapse, not for a population explosion. Some of the fall in Latvia's population was caused by return migration to Russia, especially in the 1990's. But the population of its neighbours, and Russia itself, is also falling. According to the World Population Prospects: The 2006 Revision, 46 countries will lose population by 2050, many in eastern Europe. According to Table A.9, the population of Bulgaria will fall by 35%, Ukraine by 33%, and Belarus, Romania, the Russian Federation, Moldova, Latvia, Lithuania and Poland by 20% to 30%. The March 2006 Eurostat population projections predict population decline by 2050, in 13 of the current European Union member states, including major western states such as Germany and Italy. In fact, during the 21st century, most of the world will probably follow the pattern set by the east European states during the Cold War - Brezhnev's revenge. There is no guarantee, that the decline will ever end. However, there is a reason to believe that long-term decline is the realistic scenario. You may remember (from school geography) the four phases of the demographic transition. For most of history, birth rates and death rates were high, at around 40 per 1000. Global population grew, but slowly and erratically: the first phase. In the last three centuries, beginning in Europe, death rates fell sharply. At first, birth rates remained high, and population grew: the second phase. With increasing welfare, birth rates also began to fall, and population growth slowed down: the third phase. Finally, in the usual theory, birth and death rates would stabilise at around 10 per 1000. The process took about 250 to 300 years in Europe, but some regions in Africa and Asia entered the second phase only a generation ago. But is this the end of the story? What happens if birth rates fall permanently below death rates? It seems that eastern European countries entered a fifth phase of the demographic transition - and there is no evidence that this will ever be reversed. This declining phase is now included in some versions of demographic transition theory. For the EU countries, the Eurostat study projected a fertility rate stable at 1,95. The fertility rate is, approximately, the number of children per woman: a rate of 2.1 is necessary for a stable population. An EU fertility rate of 1.95 is permanently under replacement level - and that is the high-fertility scenario. Most countries have not entered a fifth phase yet. However the Eurostat projections show a pattern, where rich countries, one after the other, go into population decline. And low fertility is no longer specifically European, and no longer limited to rich industrial countries. According to World Population Prospects: The 2006 Revision, all 45 developed countries have below-replacement fertility rates, but also 28 developing countries. Together they contain 44% of the world's population. Sub-replacement fertility now affects countries such as Armenia, Cyprus, Georgia, Kazakhstan, Sri Lanka and Thailand. It is no longer possible to say simply, that the end of the demographic transition is a stable population. Perhaps a shrinking population is "normal" - as growth was once considered to be "normal". Perhaps a shrinking population is characteristic of any planets with an advanced technology. If so, then Latvia and Estonia have also answered a theoretical question of SETI (Search for Extra-Terrestrial Intelligence). The famous question, used by those who do not believe in extra-terrestrials: if there are billions of advanced civilisations, why are they not here to visit us? Look at the table of Latvian population, project it 10, 000 years into the future, and you have an answer: there are not enough aliens to build a spacecraft. All those huge galactic federations in science-fiction films, with billions of billions of alien inhabitants, may simply reflect mistaken demographic theory. Fertility stays at current levels in the constant projection scenario, which leads to incredibly large numbers for world population. For the European population, however, it leads instead, in the long run, to startlingly low numbers.... The European Union... would fall by 2300 to only 59 million. About half the countries of Europe would lose 95 per cent or more of their population, and such countries as the Russian Federation and Italy would have only 1 per cent of their population left. Although one might entertain the possibility that fertility will never rise above current levels, the consequences appear sufficiently grotesque as to make this seem improbable. It is an absurd contrast: anti-immigrant parties complain of an endless stream of immigrants, and crowded cities. Yet the UN estimates of Proportion of Global Population by Region show, that the scale of the relative decline is enormous. So great, that hundreds of millions of immigrants would be needed to restore Europe's share of global population. The more recent UN Replacement Migration Report calculates the immigration to restore the age balance. The summary table for the European Union includes a scenario with a constant ratio between the 15-64 age group and the over-65 age group. From 1995 to 2050, a total of 700 million immigrants would be needed. That scenario includes EU population growth - in effect it diverts African and Asian growth to Europe. The immigration needed to maintain EU population is smaller, but would still horrify anti-immigrant parties - 47 million immigrants. All three approaches (maintaining global share, maintaining age structure, maintaining population) need massive immigration. The Roman state had become strong enough to hold its own in war with all the peoples along its borders, but a shortage of women meant that its greatness was fated to last for a single generation, since there was no prospect of offspring at home nor any prospect of marriage with their neighbours......When it was time for the show, and everybody was concentrating on this, a prearranged signal was given and all the Roman youths began to grab the women. Many just snatched the nearest woman to hand, but the most beautiful had already been reserved for the senators and these were escorted to the senators' houses by plebeians who had been given this assignment. Some new form of 'population raiding' is not impossible, although probably more sophisticated. At present, the voters in rich countries see migrants as a threat. That attitude assumes that there is a vast permanent reservoir of migrants, for instance in Africa. But in 25 or 50 years, if rich states decide they need millions of migrants, they may simply not be available. If African standards of living rise, and fertility declines, Africans might have no enthusiasm for migration. In fact, it is probably already too late to adopt a mass 'immigration strategy' anyway. Mass migration may be a historically transient phenomenon. Migration from state to state is certainly declining as a percentage of all travel. International passenger traffic has grown enormously since the Second World War: if international migration had grown at the same rate, almost everyone would be an immigrant. Technological changes are an even better indication: in 1550 it took a year for a ship to sail from Europe to Japan, and one-third of the crew died on a typical return trip. Today it is feasible to fly the entire population of Japan to Europe in much less than a year, but migration has not increased proportionately. The trend seems to be to a world with much travel, but permanent residence in the state of birth. So Europe can no longer simply open the gates, and wait for the immigrants to arrive. The environmental movement has reacted against media attention for a global population implosion, because it suggests that population polices can be abandoned, or even that growth should be promoted. Certainly this is not the first population collapse scenario to attract public attention. In Europe in the 1930's, Hitler and especially Mussolini pursued 'natalist' policies, to promote large families. The fear of population decline was widespread: yet after the Second World War came the famous 'baby-boom'. The predictions of population collapse proved false. That will probably not repeat itself. The present decline in fertility in Europe is a long-term phenomenon, and seems less likely to reverse suddenly. Although it is true that world population will increase, (and probably double), before it starts to fall, a new phase in global demographics seems inevitable. The distribution of population will change dramatically. That has inevitable political consequences. In 1950 the USA was 1,5 times the size of Russia - the Soviet Union was of course larger than Russia alone. In 2050, the USA will be almost four times the size of the Russian Federation. The United States, with high immigration, will avoid absolute population decline: it will probably overtake the complete present territory of the EU. In the next 25 years, according to an EU Green Paper on Demographic Change, the EU population will decline slightly, but US population will rise by 25%. According to the World Population Prospects 2006 Revision, Table A.6, the United States will maintain third place in global population in 2050. At present, Germany is still the 15th largest country. In 2050 it will be outranked by the Congo, Ethiopia, Uganda, Vietnam, Iran, Turkey, Afghanistan, Tanzania and Kenya. The largest European state, the Russian Federation, will sink to 15th place. The most spectacular changes will result from the combination of high growth in Asia and Africa with decline in Europe. The greatest total population increases will be in countries such as Ethiopia, Pakistan and Zaire. The poorest countries generally have the fastest growth: Yemen, Rwanda, Liberia. So even though the next generation in Europe will probably not notice the absolute decline, the shift in relative position will affect peoples lives. Most importantly, through the issue of immigration. European official attitudes to immigration are changing. In July 2001 the European Commission proposed a European immigration policy, with official recognition that Europe is an immigration zone. At the same time anti-immigrant parties continue to make electoral gains: they set the agenda for immigration policy. Immigration 'doors' of the last 20 years - asylum, bringing over family members - are being sharply restricted, to please the anti-immigration electorate. These will be typical policy conflicts of the next 10 years. The real problems will come when Europeans realise, that even cities full of immigrants are not stopping the population decline. Eurostat: Ageing characterises the demographic perspectives of the European societies. (Statistics in focus 72/2008. Catalogue number: KS-SF-08-072-EN-N). World population in 2300, Final version, UN Population Division, 2004. State of World Population 2004, UNFPA, United Nations Population Fund. Europe's population has developed new tendency to shrink, Science. "Europe's population has aged to such a degree that it will likely continue to shrink, even if birthrates rebound to a one-for-one replacement level, a new study suggests....The year 2000 marked a key turning point for Europe, reports the research team, led by Wolfgang Lutz of the Austrian Academy of Science, in Vienna, and the International Institute for Applied Systems Analysis, in Laxenburg, Austria." Watch the population decline from the east (blue) take over West Germany, from 1990 to 2020. The proximate determinants during the fertility transition, Jean-Pierre Guengant. On the prospects for endless fertility decline in South Asia, Alaka Malwade Basu, 2002. A Guide to Global Population Projections, Brian C. O'Neill, Deborah Balk, Melanie Brickman and Markos Ezra, 2001. Statistisches Bundesamt: Bevölkerung Deutschlands nimmt von heute 82 Millionen bis zum Jahr 2050 um über 10 Millionen ab. Halve eeuw migratie had zeer geringe invloed op vergrijzingsproces, Netherlands Institute for Demography. A warning not to expect too much from immigration as a correction for the 'greying' of western societies: young immigrants change the age structure when they arrive, but later they also become old.